Having lived in Oxford for a year during my postgraduate studies at the University, going back to the beautiful city of dreaming spires feels like home before I even arrive. The flip side of this, though, is that it’s challenging to find a hotel or place to stay the night now that is comparable to the comforts of my college, and brings back the same sense of safety, relaxation, and decadence that only living in Oxford brings. The Old Parsonage Hotel, however, is the ideal home away from home. 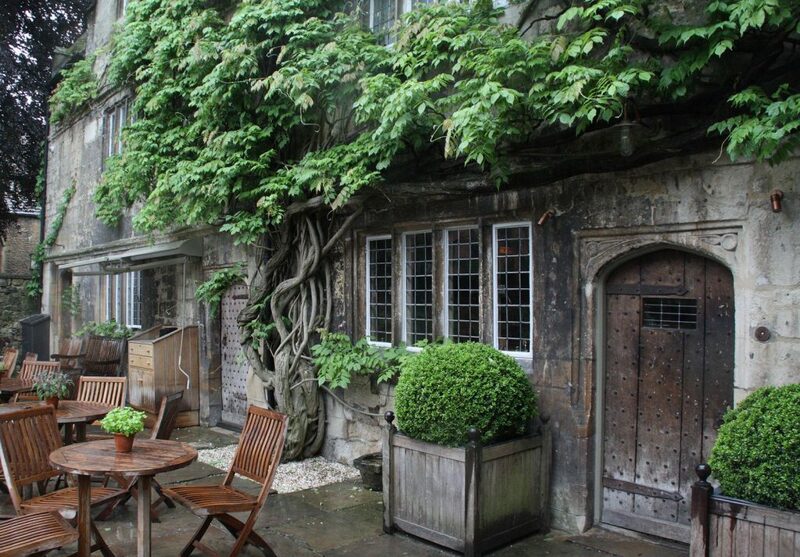 Set in the heart of the historic city centre at the end of the beautiful boulevard St Giles, the hotel is a stunning 17th century wisteria-clad Parsonage. With a beautiful terrace to lounge outside on during the warmer days and nights, and laced with foliage, the hotel is itself a thing of beauty. 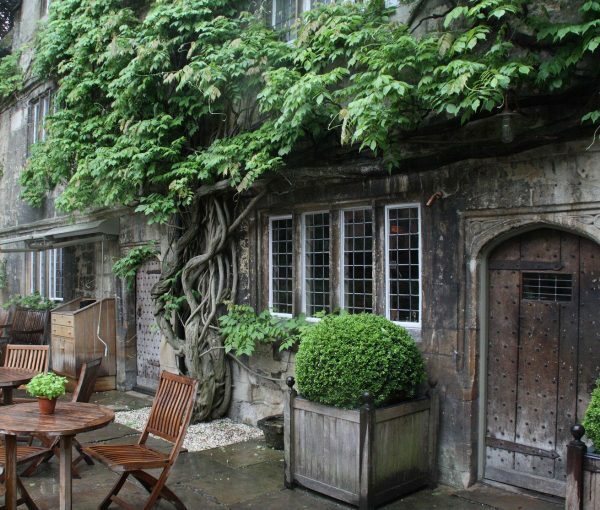 A few minutes walk from the Ashmolean and Jericho (Oxford’s lively, quirky, food and dining district), the high street, and of course, the many colleges, its location is ideal for a weekend or night in Oxford. 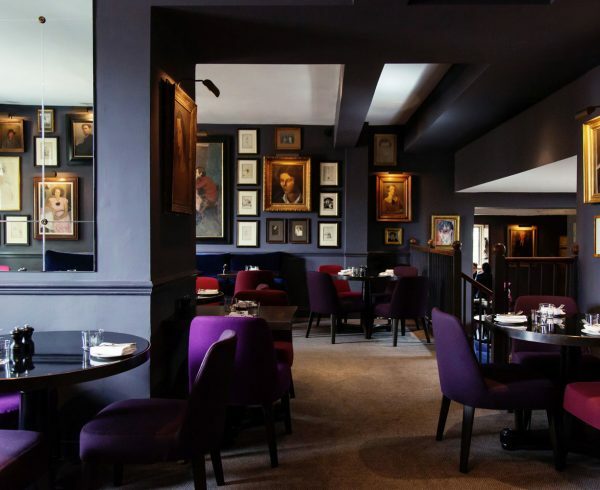 Akin to an eclectic country house in the city centre, the hotel is decked out beautifully in suave deep blues and purples, interspersed with intricate 20th century portraits, offering a sense of a modern chic interior amidst an historic setting. Upon entering reception, one is greeted by a roaring wood fire, low beamed ceilings and warm sumptuous armchairs, rich fabrics, dark wooden panelling and a sense of being in a luxurious home-away-from-home. 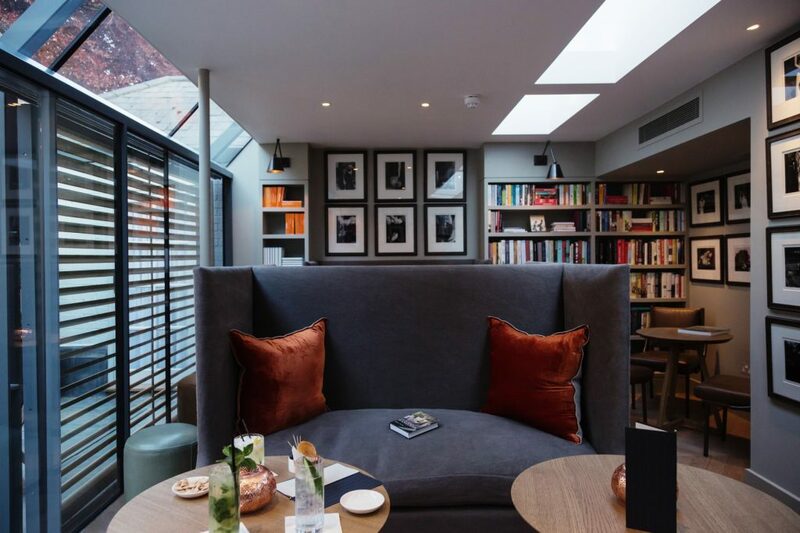 Like a true country home, the hotel features a lavish library on the first floor, which is a modern and intimate space with glass sliding doors opening onto a private courtyard terrace that must be fantastic in the summer as a space to recline with a book and glass of wine. In the true manner of Oxford, this library offers an artfully curated range of books to enjoy, ranging from art, literature, culture and politics, to Oxford and its own history. 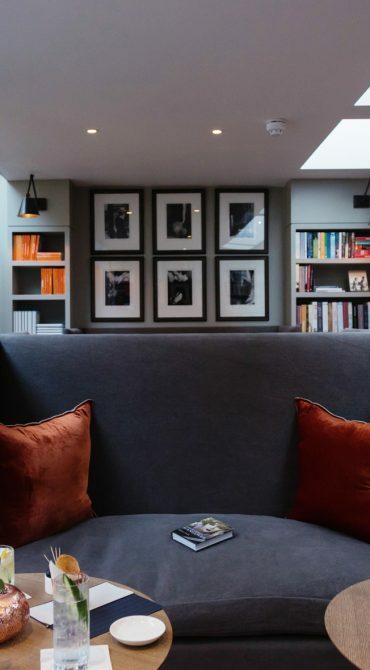 My guest and I loved this space as a welcome respite from the bustling streets of Oxford but a more luxurious space to read than that of a formal college library (that I still shudder to remember). 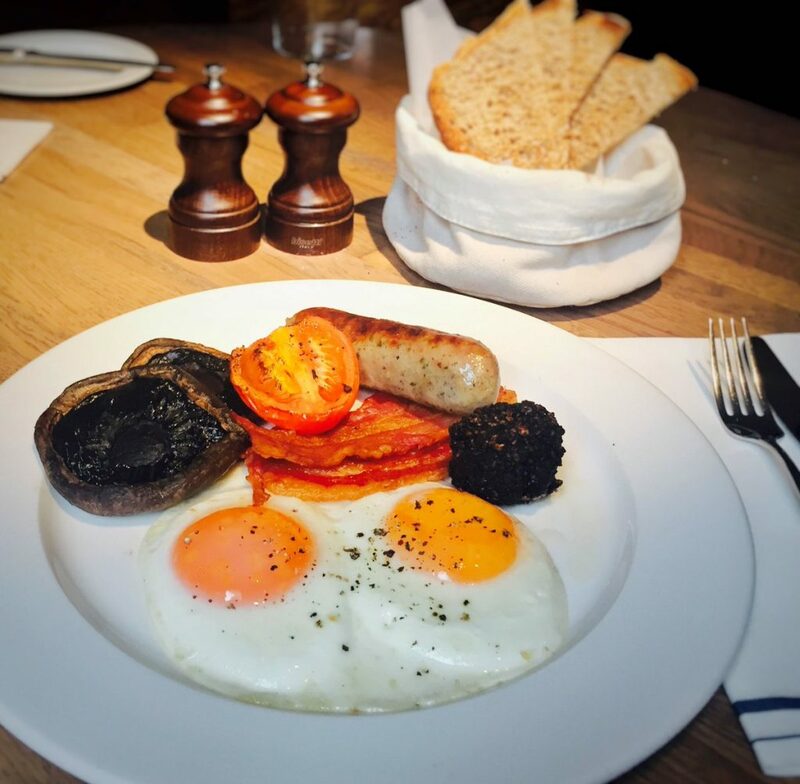 There is, of course, a fantastic restaurant in the Old Parsonage Hotel too, the Parsonage Bar & Grill, where guests can enjoy their breakfast (more on that later) as well as classic British dishes with a light and modern touch. Decked out in the familiar shades of deep blue that mark the hotel’s intimate interior, there is a sense of being in a decadent private members’ club, with a stunning bar to match. 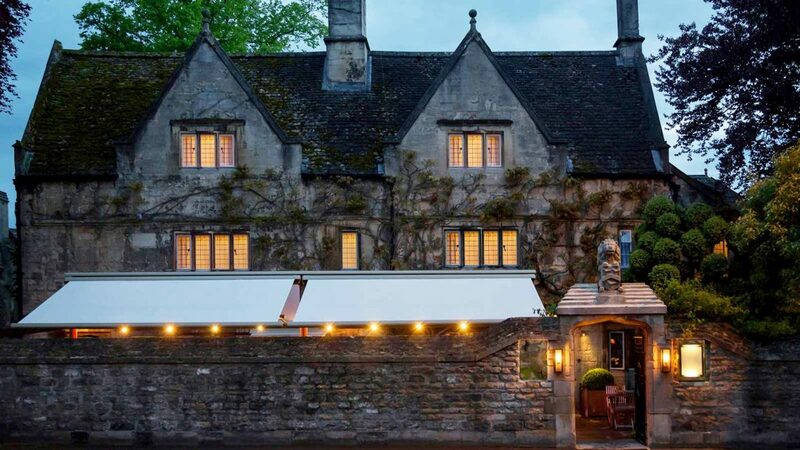 Yet despite the sense of luxury that exudes from the restaurant, it is extremely reasonably priced – and indeed offers a set lunch menu from Monday to Friday – rendering it a destination worth visiting for a meal alone, if not a night’s stay. The rooms are as luxury as the rest of the space, and each is individually designed by Sally Conran using all natural materials. The same rich colours permeate each beautiful bedroom, with deep blues, purples, greys and reds, whilst decadent fabrics complement the hues (think: velvet, linen, and wool) on a backdrop of traditional Parsonage features. The ceilings are low, the doors are lined with beams, and the windows are large – and all in all, they ooze luxury. Our room, number 29 and on the top floor, was a wonderful large and spacious minimalist white space with two luxurious twin beds, plenty of fluffy cushions, more rich fabrics and a lovely warm throw. 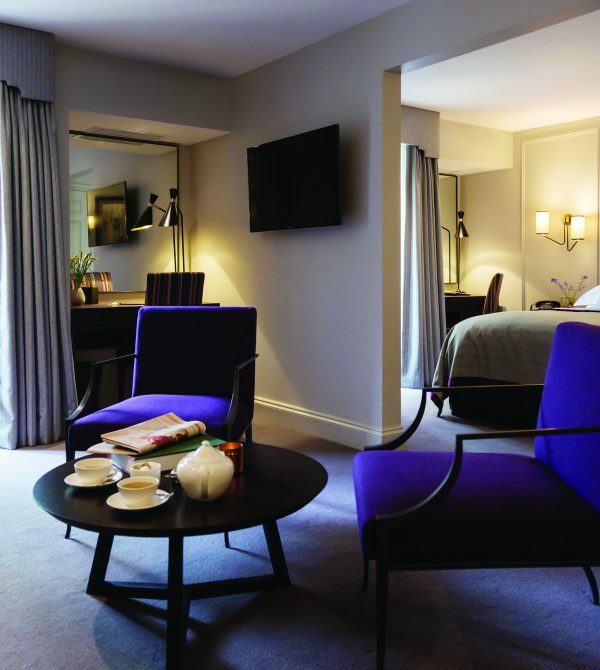 Complemented by a large TV, international radio (a very cool, retro design), large desk, all the amenities one would need (hair dryer, etc etc) and complementary water from Blenheim palace in the mini-bar. The bathroom is absolutely to die for (I squealed upon entry) with heated flooring, a huge glass shower space with fantastic pressure, beautiful large white bath tub, two spacious sinks and plenty of elegant lighting. As big as a bedroom, and cosy as a spa, one relaxes merely by way of being there. Within the room, and indeed beyond, there were so many wonderful bespoke touches too, that make the Old Parsonage Hotel stand out amongst the rest. Firstly, the bathroom amenities were particularly lovely and of a much higher standard than your average 4 star hotel shampoo and conditioner (I intend to source these again for myself). Then, within the bedroom, were plenty of magazines to enjoy, morning newspaper on delivery, postcards of the hotel and Oxford, luxury letter writing sets, and a 7pm turn down room-service. Beyond the rooms, one can use the complimentary hotel bicycles to explore Oxford in proper style, and the 24 hour room service is of a particularly personal and warm service. 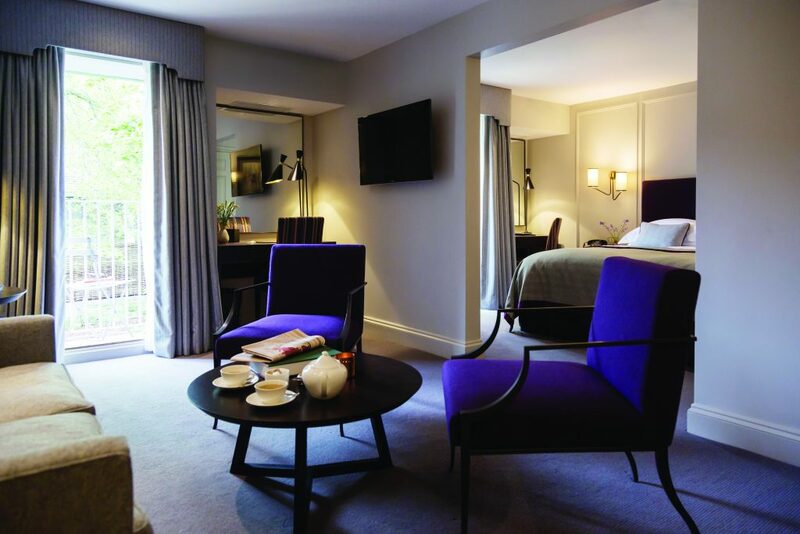 I slept extremely well in the quiet room (despite being on busy St Giles boulevard) and Sunday morning enjoyed breakfast in the hotel’s restaurant which is served from 7am – 11am. There is no buffet here, but instead an elegant menu service that makes breakfast feel more calm and decadent, than fighting for the buffet table. 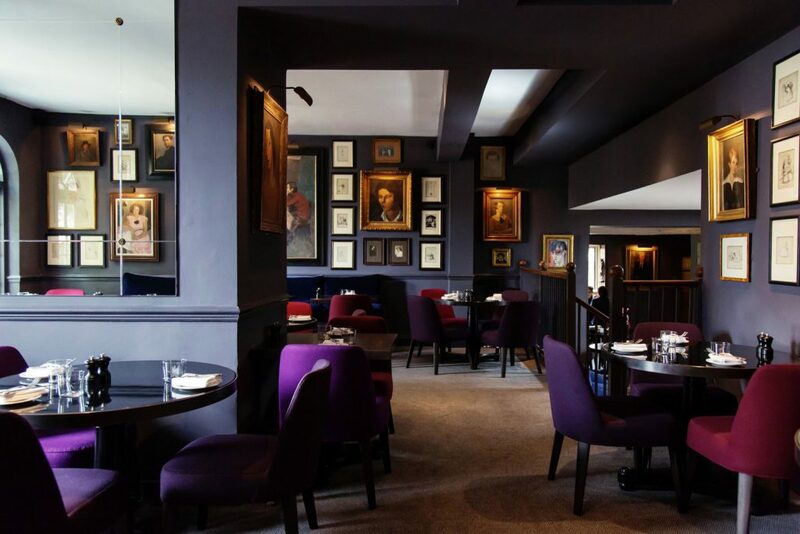 An array of newspapers await to be read, and the large chairs (still in those beautiful hues of deep blue, purple and grey) along with the dark wooden tables ensure the ambience is relaxing and decadent. My cappuccino was excellent (so good, I had two), and the grapefruit juice that came with my food was freshly squeezed and delicious. I enjoyed the full English breakfast of bacon, sausage, black pudding, two poached eggs, mushroom and tomato, and toast with butter and jam. 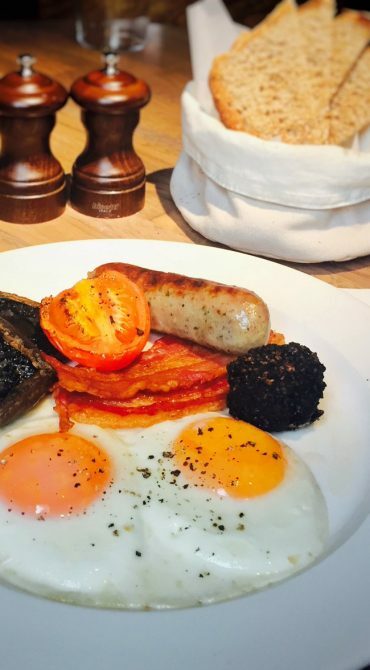 Everything was of an extremely high quality and the black pudding in particular was surprisingly light and delicate, whilst the sausages were lightly spiced and meaty, indicative of their premium calibre. Everything was excellent, and the cool and collected service imbued breakfast with a sense of calm privacy – a very welcome tone to a tired Sunday morning after a busy weekend. Check out is at 11am, and thus, though I was kindly offered to stay until 12pm, I left to return to London shortly after my delicious meal. I left with a sense of restfulness and calm, feeling as if I had just been home for a private weekend to indulge and escape. There is something wonderfully elegant and luxurious about this hotel that makes me want to return soon. I don’t know if it’s the rich hues that permeate the building and the sumptuous fabrics that give it this sense of decadence, or the demure staff who treat you politely and graciously yet seem intent on giving you the privacy you need. A lovely, lovely experience and I will most certainly be back next time I return to Oxford for another weekend to my former home. And this time, I know I have a home-away-from-home.